A couple of weeks ago, the NBA decided it wanted to get $1 million from Tim Donaghy as reimbursement for their investigation into his gambling (and also a little something… you know… for the effort). Donaghy’s lawyers responded by dropping a bombshell that refs fixed past playoff games… and they did it right before the biggest game… of the biggest finals in years… with 2 of the top 7 television markets tuning in. Suddenly, the top story on morning talk radio is Tim Donaghy… not Celtics-Lakers. ESPN’s SportsNation is asking if people believe the 2002 Lakers-Kings series was fixed… and 76% are saying “yes” right now. It is a scandal that could be as big as steroids in baseball… in that people are starting to ask if outside agencies need to investigate… and if Congress needs to hold hearings. And oh, by the way, what was the biggest story line coming out of Game 2? The free throw disparity. So here we are, heading into Game 4, and suddenly “Pierce-Garnett shooting woes” and “will Gasol or Odom show up” have been bumped down to the middle of the list of things most people are now watching for. Everything on the list before those now have to do with the officials. Now the question is… how will this affect the rest of this series? The referees aren’t just under the magnifying glass now… they’re the plastic army men I used to set up on the side walk… a split-second before I trained that beam of magnified sunlight onto their unsuspecting heads. How will they react? Will they live up to the perception that the superstars get all the calls? That the home team gets the benefit of the doubt? That the NBA will do what it needs to do to extend a series and maximize profit? Or will the refs call this one right down the middle… and a foul is a foul… whether it gets Kobe Bryant or Glen Davis in foul trouble or not. Could tonight be the night where Kobe gets a couple of offensive fouls early while trying to be aggressive? Will an over-emotional KG get tossed on a second technical? Will Paul Pierce and Derek Fisher each end the game with 8 turnovers because the refs are calling every travelling violation? And if the refs decide to make sure the fouls are all even and there isn’t even a hint of the appearance of impropriety… who does it benefit? My feeling would be that if all things are equal, then its simply a matter of the better team winning… and I think that has clearly been the Celtics so far in this series. But it will be interesting to see. Can you blow a whistle? Are you capable of spotting a hand slap from 40 feet away? Do you look ridiculous in tight pants? (Who doesn’t? I’m obviously talking about men) If so, you are advised to apply to the NBA because if Tim Donaghy sings like ESPN is reporting, David Stern is going to need a bunch more referees. Yup, Donaghy supposedly knows 20 refs or so, who have some connection to gambling. But didn’t the almighty Commissioner Stern refer to Donaghy as a ‘rogue, isolated criminal?” If this blows up, I hope some owners (don’t let me down Wyc) will step up and put pressure on Stern. He doesn’t deserve to skate on this issue if it’s proven several referees bet so much on Keno in Atlantic City. Finally some Celtics related news to discuss. The Herald’s Steve Bulpett continues to be the only local writer who delivers the goods on a consistent basis. He has a great interview with Doc Rivers about Al Jefferson and the possibility that Celtics fans may have an inflated view of Big Al’s talents. You know what? Doc is right, but what a way to rain on a guy’s parade. Or is he trying to ease our pain when Ainge pulls the trigger on the Garnett trade next week? Scott Souza has Sean Grande’s take on where the Celtics are going, what other moves they need to make, and most importantly, what it’s like to work with Cedric Maxwell. Bulpett also spoke with Ryan Gomes regarding his conversation with league officials about comments the young forward made about the team clinching the second worst record in the league. 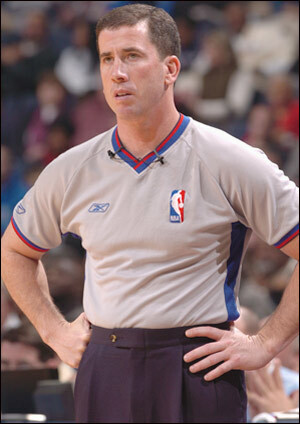 That takes us to the alleged dirtbag Tim Donaghy and the betting scandal. You’ll find countless stories in just about any newspaper or web site but since I love the tabloids, let’s take a look at what the NY Post has to offer this morning. There’s also more crazy stuff from a postal worker who claims Donaghy flipped out when he bumped his mail truck into the ref’s recycling bin. Now I’m not sure where the league’s investigation will go, but one things for sure, Donaghy is a nut job. In other news, Peter May writes about a bunch of topics including Kobe Bryant and Team USA, Yi, Ryan Gomes and Brandon Wallace’s bonus.